Today we say happy 45th birthday to the Magic Kingdom. This park opened on way back on October 1st, 1971, and is more popular now than ever. 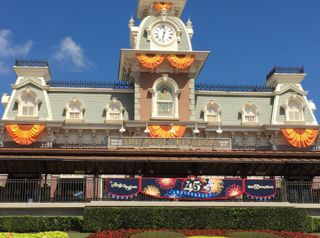 Disney hung a banner near the front of the park, to commemorate the occasion. This location is also the most popular spot in the world for photographs.